Our distributed workforce model empowers 10uppers to work where they love, providing us with the freedom to create from inspiring places and spaces around the world. Take Whitney Yadrich, a Senior Project Manager & Team Lead over in Shawnee, Kansas where you’ll also find her husband, their two dogs (Lita and Sarge), and the town she fell in love with. 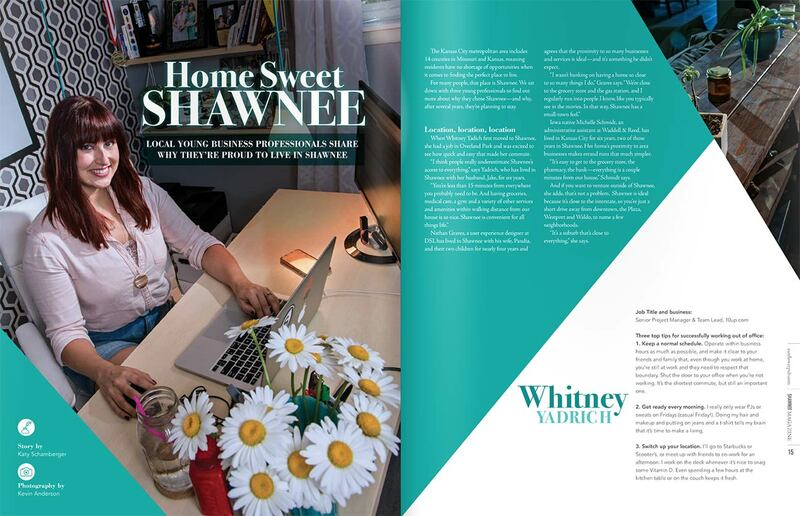 Whitney was recently featured in the Fall/Winter issue of Shawnee’s local magazine, where she and two other young professionals dish on their love for their hometown. Supported by our remote work culture, she credits the city for offering inspiring work spaces where she can change-up her scenery, recharge, and stay focused. Whitney also offers tips for the work-from-home professional, namely: prioritizing a normal work schedule, taking the time to get dressed every morning despite the lack of a mandatory commute, and switching up locations regularly to keep things fresh.